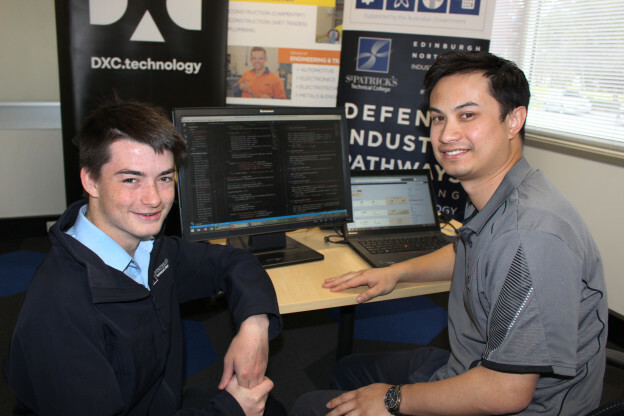 To meet the demands of Adelaide’s burgeoning Defence industry employers must be more hands-on in helping produce the next generation of workers, according to the global IT services company DXC Technology. As part of the College’s P-TECH Australia program, DXC Technology will help mentor and guide students undertaking a TAFE SA Certificate IV in Information Technology studies at StPatsTech. This course is already supported by Saab Australia who have welcomed DXC Technology’s commitment to building the local workforce. 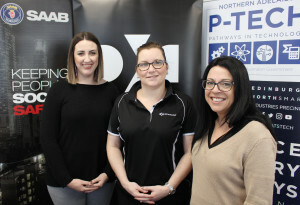 Leanne Jarvis from DXC Technology (centre) speaks with Rebecca Giovine from Saab Australia and SAF’s Toni Hartley.“They have just been fantastic to work with. Once Stuart and HR Manager Leanne Jarvis heard about what we were doing so successfully with Saab Australia, they immediately put their hand up to be part of the program,’’ Ms Hartley said. This entry was posted in Industry Office, Latest News on 07/09/2018 by St Patrick's Technical College.